Mostar is a student city on the surface (engineering underneath) sitting abreast the fast-running Neretva riverwhich neatly and unfortunately divides the town into Muslim and Croat areas. The famous bridge, built by the Ottomans in their golden era was an ornate, engineering marvel. It was destroyed for tactical but most symbolic reasons by the Croats in 1992 bringing Mostar into the international spotlight. The sad fact that it takes the loss of a bridge rather than life to galvanise the international community is not lost. Rebuilding the bridge was again a Western attempt to symbolically rebuilt the city spirit. That has barely happened of late but at least all is peaceful in the sun. The river can be heard everywhere. It gives the city shape but also a false sense of coolness. For it was hot especially amongst the tourist hoards and twisty streets of old town. The cobbles were cool so I walked barefoot around. The old town is all Turkish stalls and shops selling all manner of shite. The bridge itself is small and impractical for anything other than tourists. The more interesting parts for me (aside from meeting a cool, old dude) were the destroyed buildings further away, on both sides but primarily the Turkish side. 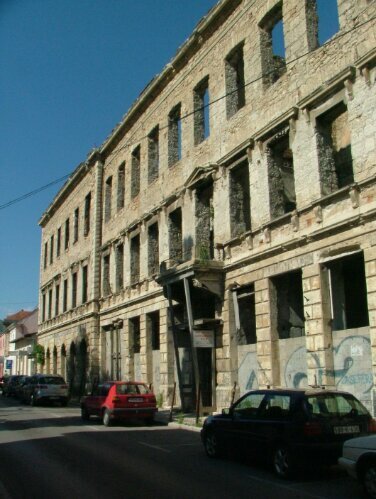 Ruined warehouse sized buildings stand testament the random destruction of the war. Beyond the tourist trade there is little money to fund renovations. They, like Bosnia itself look beyond saving anyway. The reconstruction of a society input from more than an engineer to bridge. ‘Leaving Belgrade was the right decision but I was happy there. The friends I made, both local and international met me on the last night and we had dinner together. The nightlife is pretty intense so I was fleeing the city very content. I got off at Sarajevo’s East Bus station at 5am in the Serb part of town. It provided the perfect opportunity to ask and learn your way into a culture. I needed direction, didn’t want to get a taxi and needed money. I walked down the main road, generally aware of my destination but knowing it was impossible to actually walk it. At the bus stop was an older man with rudimentary English and an understanding I was clueless but genuine. He directed me to the ATM in Bosnian and when the bank only gave me 50KM (about 25 euro) notes, he explained to the bus driver and I got a ride for free. The rest of the journey into town consisted of him pointing out buildings of note and some significant war damage. He was of the age to have seen the city in his prime. Now aged about 55, he would have seen much. That area of the city is predominately Bosnian-Serbs, the generally acknowledged bad guys in a war with almost no good guys. My friend got off the bus a few stops before me, informing me to wait 2 minutes for the river. I descended and was greeted by near silence. No traffic ruled the streets and only a few people scuttled to work. This was Sarajevo before the day begins. I noted where I needed to go and started taking pictures of the city, a guide to the streets without humanity. 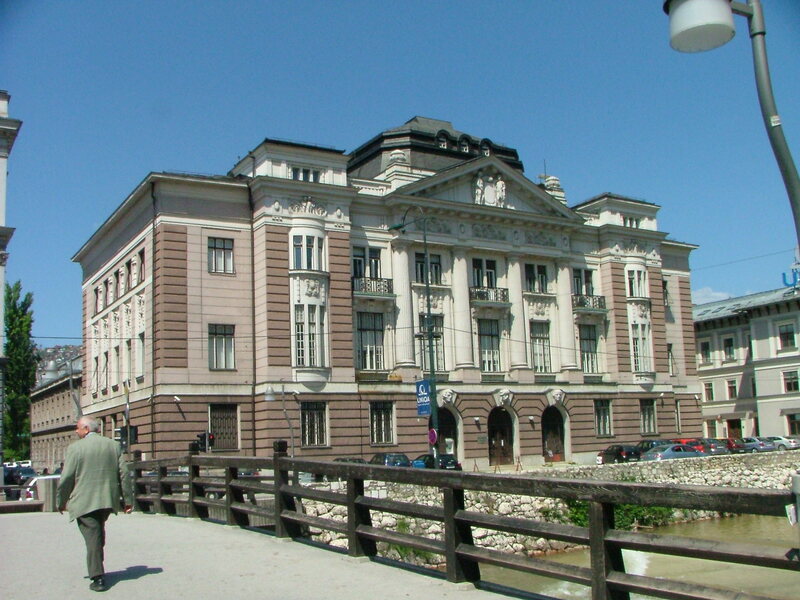 Sarajevo has some grand buildings, fixed up from afar but on closer inspection the damage of the siege and battles is still visible. Next to the river it is noticeable how many cars parks there are. In the past, in that space would have stood history. Sarajevo is a very long but narrow city. Entering it, it feels like a major world city. The trip takes time. But it is only 346,000 people. Geographically Sarajevo is slightly bizarre, nestled in a long narrow valley with a small river through it and beautiful green hills spotted with red roof houses. Yet even at that early hour the cultural symbols which helped fuel the war sit majestic throughout the city and importantly alongside each other. The squeaking of trams, trawl of buses and hum of cars indicated the city was waking. The smell of coffee and cigarettes at the breaking dawn accompanied humanity to the streets. I won’t bother too much about the sights of the Old Town with its cobbled streets and vendors or the bridge of Mostar and the stunning countryside in between. You can find that out for yourself. Bosnia has geography beyond its size. It’s now a safe and hugely satisfying part of Europe with its recent culture wars indicative of its diversity of cuisine, music, religion and dress. It is not unusual to see a woman in headscarf walking through the old town alongside a Serb smoking and a Croat drinking. The women are beautiful and the men are wide. 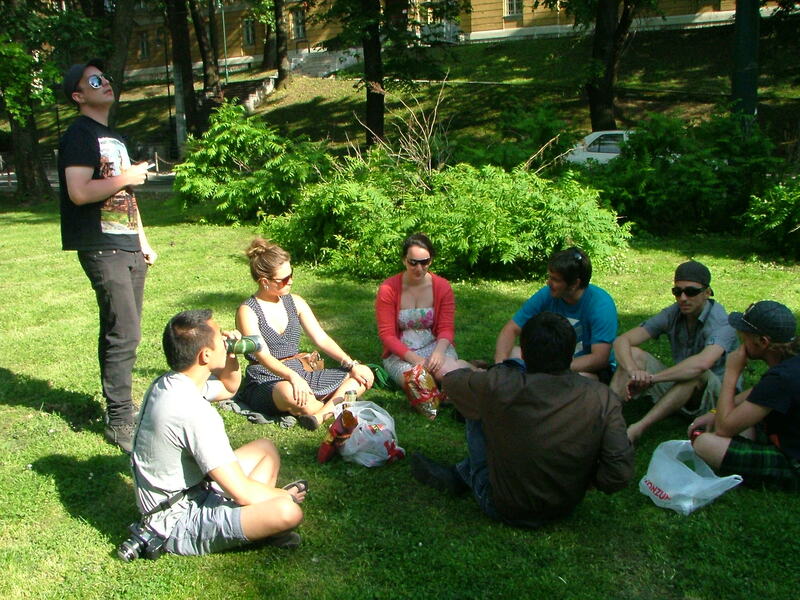 In Sarajevo, we sat in the parks near the river, drank beer and the local brews and generally enjoyed the magnificent weather. Later we could be found in cafes and bars, listening to live music and encouraging Jan to drink. Some nights were remarkably drunk. There are videos to prove it. I probably met 10 cool people including locals. I enjoyed it and the football too. The war museum is haunting, disturbing and strangely small, possibly to avoid welling up tensions. The look-out near the cemetery is a good spot for a beer as the sun falls behind the hills. The World Press Awards was in town and generally highlighted the beautiful nature of the world and the destructive nature of humanity. 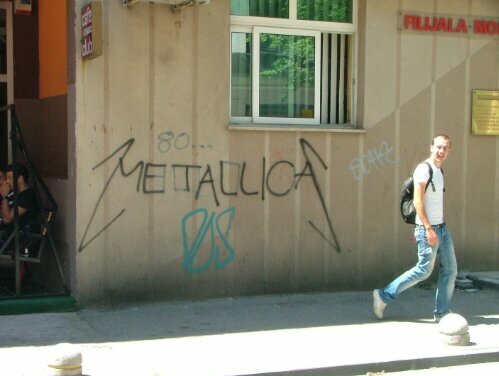 Oddly I wasn’t as impressed by Sarajevo as I expected. t was still great but I had very high expectations. They were almost met but I was surprised by its small size. And you can’t sit in a cafe, park or bar forever. Inevitably the time to move came and we (now four of us) took the bus ride to Montenegro, a truly stunning little gem. The political impasse in Bosnia caused by a flawed constitution emphasising multiculturalism and economic stagnation are hard to note. Serbs are very keen to talk of their issues while in Sarajevo I heard little despite cafes dominating the social scene. Possibly it was linked to the Presidential elections taking place in Serbia at the time or on the flipside possibly the lack of political initiative in Bosnia. Bosnia is more ethnically and politically divided than ever as the political and economic goodies are handed out equally to different groups. While war or a full-scale conflict is unlikely now, the rise of identity politics and the overriding notions, nay, laws of cultural rights bring into focus how best to manage these contentious rights. Repression or forced assimilation (like France) is not the answer but something between recognition and the destructive notion that only ‘we in question’ have the right to decide needs to be found. Democracy is a flawed system at times but one in which the majority has a duty protects the minorities. Right now Bosnia is not a democracy but in peaceful limbo. The people haven’t been empowered or trusted with power. Decisions ultimately still rests with the UN High Commission. The present constitution enshrines total multiculturalism to the farcical extent that almost every position has a Serb, Croat and Bosnian holder. 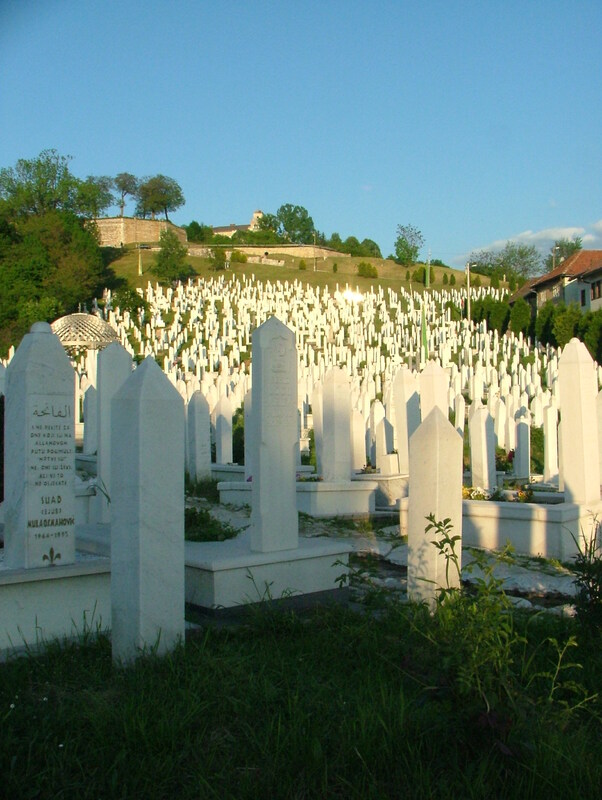 The Dayton Agreement has managed to enforce the idea of Serbs-Bosnians (i.e Serbs who happen to live in Bosnia), Croat-Bosnians and Muslim-Bosnians rather than Bosnian-Serbs (for example) or simply Bosnians. The hope for a collective identity has been lost. The further out of Sarajevo you go, the more strident national symbolism are seen. The future isn’t hopeless but it is stagnant and it will lead to inevitable political fragmentation and all the possible consequences. 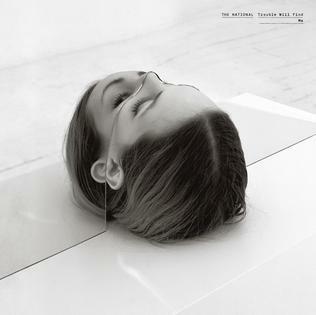 While I wait with butterflies for the release of The National’s new album, to allow me to work, I’ve be listening to John Grant (inbetween bouts of Japandroids, Camera Obscura, Kurt Vile and Youth Lagoon) if you never heard The Czars you missed out. But no need to over worry. 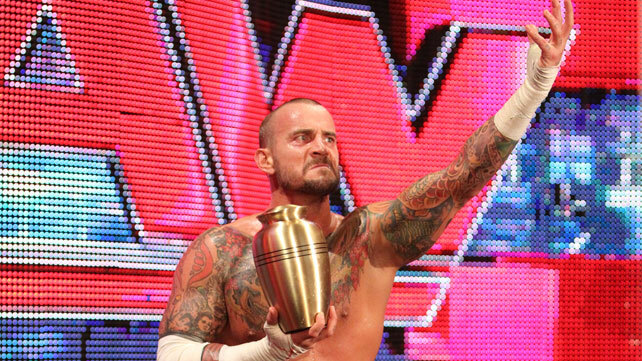 His Queen of Denmark from 2010 is class. Its direct simple melodies are almost pub sing-along at times and yet his lyrical range and directness never fails to shock and amuse. Well-worth a listen. For example, his take on ex-relationships! I wouldn’t normally comment on Formula 1. It gets too much attention and blanket TV coverage as it is. On a skill level, I regard rally drivers as superior but more to the fact, I don’t understand the idea of watching a GP for two hours with very little action at the top of the race. Imagine actually paying hundreds of pounds to see the leader every 2 minutes. Your only comment could be ‘ahh the order is the same.’ Or ‘he must have been overtaken.’ That said, I’ve never been to petrol head so maybe I just don’t get it. The other side of F1 is the ‘glitz and glamour’ of the event. After all it is really a huge marketing event. The attending fans don’t pay the bills. It’s the advertising and that explains the Jackson Pollock jumpsuit and cars. This would be just irritating but it also deeply affects the ‘sport.’ Drivers are sponsored by their parents through the go-cart stages and later by large corporate entities. Fernando Alonso may be a talent but the backing Santander provides him and his team is vital to getting him the drives. It’s not an every man’s sport. Last weekend F1 made its annual trip to Bahrain. This jolly is financed by the state as a marketing facade for the country. Dubai and Qatar run similar subsidised events but neither of those states does so under the cloud of social, political and economic repression of its own people. The argument over migrant workers in Dubai and Qatar can wait for another time. The reason there are considerably less migrant workers in Bahrain is the relative poverty (in Gulf terms) and the requirement the people do the ordinary jobs usually reserved in the Gulf for the Indian subcontinent. But not everyone has to work. There is no financial reason for this relative poverty. Bahrain isn’t as rich as the other Gulf states but it is not poor. The reasons are religious and political. Bahrain’s rulers are Sunni yet the majority of the population are Shia. This explains the unrest there recently and the intervention by Saudi Arabia, another Sunni state, to protect the ruling family. The uprisings and weekly protests by the majority Shias calls for greater access to economic and political opportunity. Naturally the state isn’t budging and now refers to these marches and demonstrations as the work of terrorists backed by Iran. The presence of the US Seventh Fleet is actually just an ominous co-incidence. The royal family holds the keys to the wealth and puts on shows like F1 as a facade. 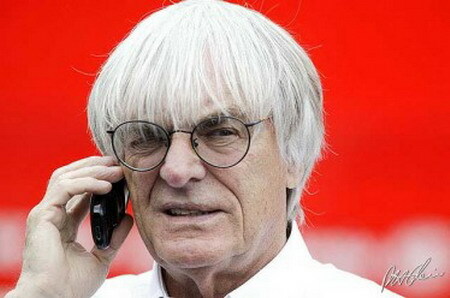 F1’s apathy to the situation and in particular Bernie Ecclestone’s comments such as “human rights are that the people that live in a country abide by the laws of that country. I might be in Africa doing 200km/h with no problem. If I come to England and do the same thing, I’m in trouble” are an abdication of responsibility. Ecclestone seems to have no idea what human rights are or that they are enshrined in international law, (however problematic and hegemonic that can be in other respects). 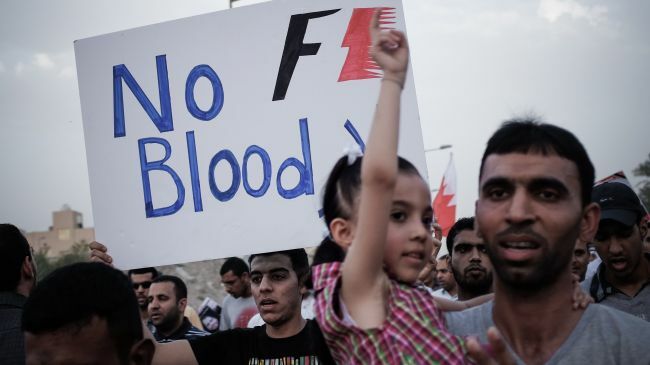 He said the rulers of Bahrain were ‘stupid’ to host the GP as it gave a platform to the protesters, failing to think beyond the dollar signs. Eccelstones’ further statement that he would consider a GP in Syria is in poor taste. I am also surprised the sponsors are happy to be associated with this GP. That is an abdication of corporate responsibility (again however weak-willed that often is). Bernie probably signing a deal with North Korea. 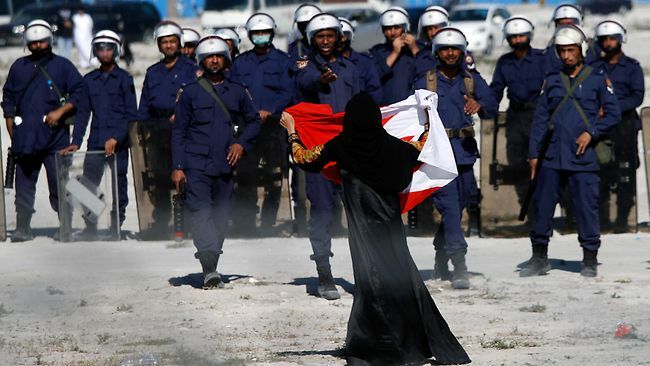 I am not arguing for change in Bahrain. I’m asking for understanding and the opportunity for peace. F1 is being used as an international facade, a token gesture to the world. In reality the GP is held under an embarrassing lockdown. There needs to be compromise and a respect for human rights. These issues are not going away. And F1 and Bernie Ecclestone need to understand that driving irresponsibly and denying people the ability to drive their own lives are not remotely the same thing.